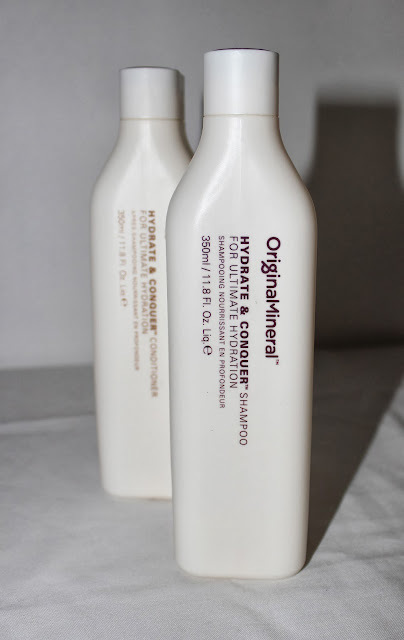 OriginalMineral (O&M) is an Australian owned haircare company with the products made right here in Australia. Ingredients are naturally derived and exclude chemicals like sulfates, sodium chloride and parabens just to name a few. Therefore when I was given the chance to try some products from O&M, how could I resist? I love trying new haircare products and those without the nasties are even more tempting. I was sent three products to try but today I am just reviewing the Hydrate & Conquer Shampoo and the Hydrate & Conquer Conditioner. This range is designed for dry, damaged or colour treated hair. To provide it with some TLC and is nutrient riche. It contains ingredients like Tasmanian sea kelp, vitamins A, B, C, E and 13 amino acids. For reference, I have long hair that used to be colour treated. I haven't actually been to the hairdressers for almost two years! My hair is dry and can be quite unruly. Because of the length, my hair can get really knotty very quickly and easily. Enough with the technical information. What did I actually think about them? Firstly I absolutely love the scent these products have. It is a carmel fudge scent that just smells so lovely in the shower, I actually find it gives me a craving for caramel (which explains why I have eaten so many Curly Wurly chocolate bars lately). I love that the scent lingers on my hair too, so when I need a sugar rush I can just give my hair a sniff... I am not strange, you would do it too. The shampoo has a nice slightly runny texture that is easy to distribute through my hair. It foams up nicely and rinses away to leave my hair feeling clean without that squeaky clean feel. The conditioner is thicker than the shampoo (as I expect it to be), it is easy to apply to the hair. I concentrate application to the lower two thirds of my hair. It leaves my hair feeling well hydrated and soft. The only thing I don't like is it does not completely detangle my hair as other conditioners do. After drying, my hair looks shiny and healthy. It even has a bit of a bounce to it! This duo has definitely made my hair feel and look hydrated, the fly aways are less and my hair just looks smooth and well kept. I was able to go about two days between washes, probably a third with a fair bit of dry shampoo. The only downside I found with these products is the bottles. I don't know if it was just the bottles I have or if it is all but I find them really quite hard to squeeze the product out! I know it is not just me as my Mum had the same problem when she tried them. The bottles just seem too hard for me to squeeze and I wouldn't consider myself as someone with weak hands. Would I recommend? Yes. If you have hair that is dry, not just slightly dry but really dry. I think it could be too heavy on really fine hair or hair that is more normal than dry. For me currently, I would not purchase this exact line as now that the weather is getting warmer my scalp gets more prone to oil (or sweaty, all this hair is hot!). Therefore I use products more suited to normal hair, next winter I would definitely consider purchasing the Hydrate & Conquer range. Head to the O&M website here for more information about the product range (the CCT Colour System sounds fantastic) and where to buy. Do you like sweet smelling hair products? Have you tried O&M? Thoughts?